Although the formal vote will not be until tomorrow night, the Elk Grove City Council seems poised to allow the placement of more billboards throughout the city. At their regular meeting tomorrow night, the five City Councilmen will hear the formal presentation to consider amending the sign ordinance to allow for electronic billboards and electronic messaging signs. If approved, the electronic billboards could be similar to those along Highway 99 in South Sacramento. The staff report says that electronic billboards "generate revenue that benefits local government" but notes the following: "The potential lease revenue to the City or other benefits available through privately-owned land may be minimal at this time given the total number of digital billboards operating or approved in the region. The current conditions may be such that an over concentration exists. Therefore, any potential benefit to the City may be limited." Electronic billboards made national news in recent months when the New York Times reported that Clear Channel Outdoors, the nation's largest electronic billboard operator, is placing electronic eavesdropping technology dubbed Radar that will be able to gather information from any cell phone that passes by one of its signs. 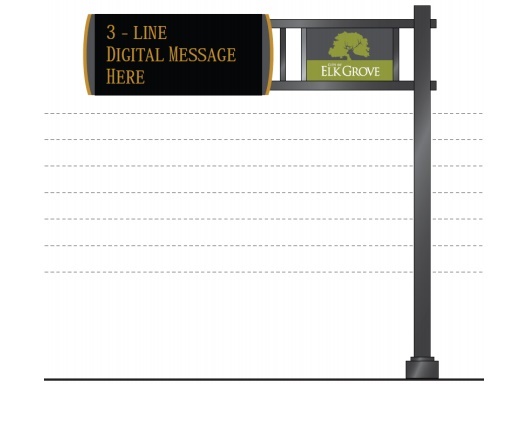 As part of their discussion, the Councilmen will also consider two types of community signs - traditional static billboards and electronic messaging signs. The per unit cost for a static sign is estimated at $25,000 with annual operating costs of $20,000 per sign while the electronic billboard (pictured above) has a per unit cost ranging from $137,000 to $147,000 with annual operating costs of $11,500 per unit. While City Councilman Steve Detrick and Mayor Gary Davis have not publicly taken a stance on the issue, the other three Councilmen voiced support for both the electronic billboards and community messaging signs during the November 18, 2015, Elk Grove City Council Meeting (See video below). Additionally, Elk Grove Vice Mayor Steve Ly has accepted cash donations from Clear Channel during 2015. Strangely, Ly, who strongly associates himself as a member of the Democratic Party and liberal causes, has chosen to align himself with a company that among other conservative initiatives it has taken up through the years was the organization of numerous pro-Iraqi War rallies on behalf of former President W. Bush. "Any potential benefit to the city may be limited." Appears to be a no brainer. I for one, would like to see this money going to a really worthwhile cause, say an animal shelter! I find this hard to believe that our city council would even consider such an expense, especially since all we hear is we need funding. It's hard for me to believe this should be a priority of our city when we are lacking in so many other ways. Costs for advertising may also be significantly more than other established forms of advertising. The message is constantly changing. This means that you run the risk of viewers missing your message because they are not able to read its contents fast enough or because your message was not displayed when the viewer was looking. In fact, what message does Elk Grove have that travelers on 99 or 5 would even be interested in? We're a small urban community with no upscale stores, pot holes in our roads we can't fix, weeds waist high on vacant lots, local traffic issues, can't even get the Mall built & much more. Maybe this is something that could be considered in coming years, but for now it is just ludicrous.